Check out our events below or view our calendar. Check out this exciting community event offering educational information, activities, vegetarian food, live music, and a focus on green businesses! The event gathers over 175 participants each year to work together to collect waste and litter from our beautiful campus. We will have the cleanup, tabling, and a raffle! We will be explaining the different ways in which coffee can be utilized. Decorate a pot and learn how to plant herbs and wildflowers, learning about the positive impact of in-home gardens. The sustainability Office will have a table where people can come up and spin the sustainable wheel of fortune for the chance to win one of our fun prizes! Everyone is welcome to attend this FREE event! Come try free samples of local, organic, and sustainable foods served here at UCSC! Prepare to be delighted by the variety of great produce, snacks, and drinks. Learn more about your UCSC Dining options, discover our local and organic vendors, and of course - mingle and have fun with friends. 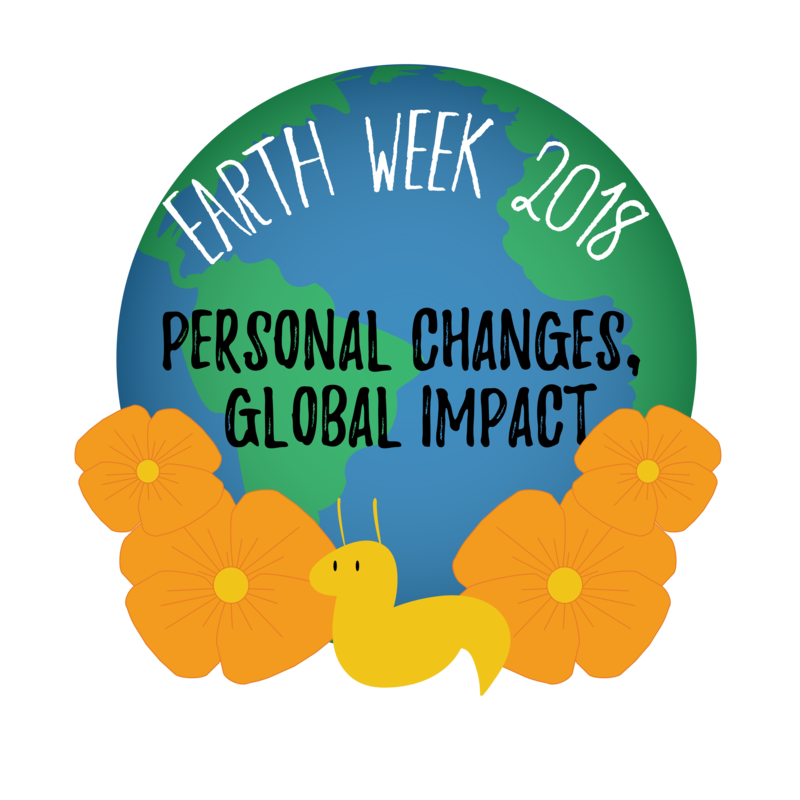 Come make DIY plastic wrap replacements and tie-dye an Earth Week shirt, learning about how you can make little changes to upcycle and reduce waste! Free smoothies with in-season and local ingredients with information about eating sustainably and affordably. Information for students and faculty about renewable energy and eight topics in sustainability. Free giveaways from Patagonia, Kleen Kanteen, Yerba Mate, and Cliff Bar. Dine with the Lorax: YOU Can Speak for the Trees! Join us for delicious food and whimsical decorations centered around the teachings of the Lorax. Organizations will be tabling so you can learn how to make a difference. Meal plans NOT required. Must be an undergraduate student and show ID. Come watch a free screening of Merchants of Doubt and engage in a discussion on the political and social influence of the fossil fuel industry and the role of Fossil Free UCSC/Divestment. Education on the vegan diet: why is it better for the planet, for personal health, how it can be and how we can make it more inclusive and accessible. Examples of what food is affordable and easy to make for students in college. Students affiliated with the Sustainability-Lab, IDEASS Program, and the Rachel Carson College Sustinability Studies Minor will showcase innovations in sustainable design and green entrepreneurship. Speakers and tabling activities focus on students’ basic needs and what we all must do to fight for them on campus. Free food provided! Please join the members and friends of Rachel Carson College for the official Earth Week dedication of student Rachel Smith’s bust of Rachel Carson. Food and drinks will follow. 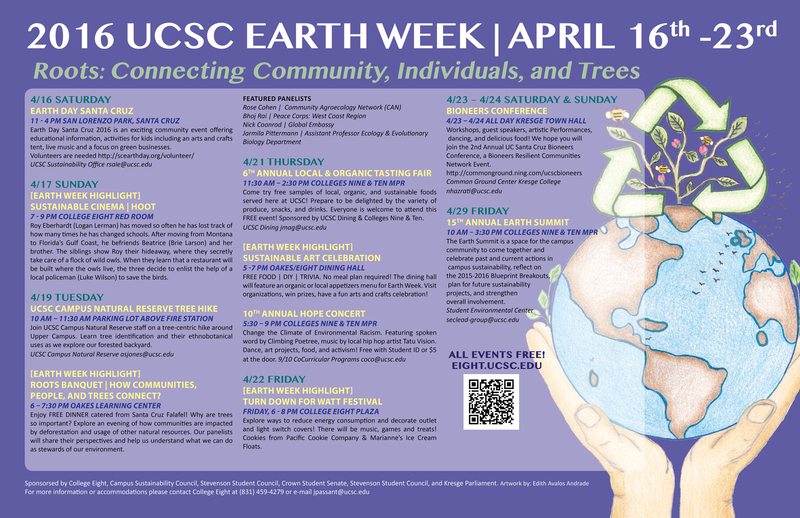 Check out Earth Week throughout the years!